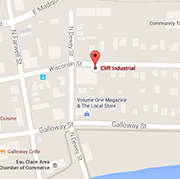 Cliff Industrial is one of the best machine shops in Central Wisconsin. Our philosophy is based on providing our customers with high quality work on time! Our experts take the time to understand your needs, and make sure you walk away satisfied. Our dedication to delivering quality, on time and on budget is the primary reason why customers continue to work with us. If you haven’t tried us in the past, give us a shot. With free delivery options available and fast turnaround time, we believe we will exceed. For more than 35 years, Cliff Industrial has been using state-of-the-art equipment and proven methods, applying specialized skills and expertise to keep your machinery up and running. When you do business with Cliff Industrial for your machinery and repairs, you know you are receiving the highest quality service available in the Eau Claire, WI area. Learn more about Cliff Industrial below and stay up to date with our company news. Watch our website as we continue to expand our quality services! Cliff Industrial participated in the L.E. Phillips Career Development Center’s 27th Annual Golf to Make a Difference Charity Golf Tournament. Free Next Day Pick Up and Delivery!